Call it "bombast", call it "buffoonery" but you do not have to tell the truth if you are a Washington politician, and retired Navy officer like John McCain. 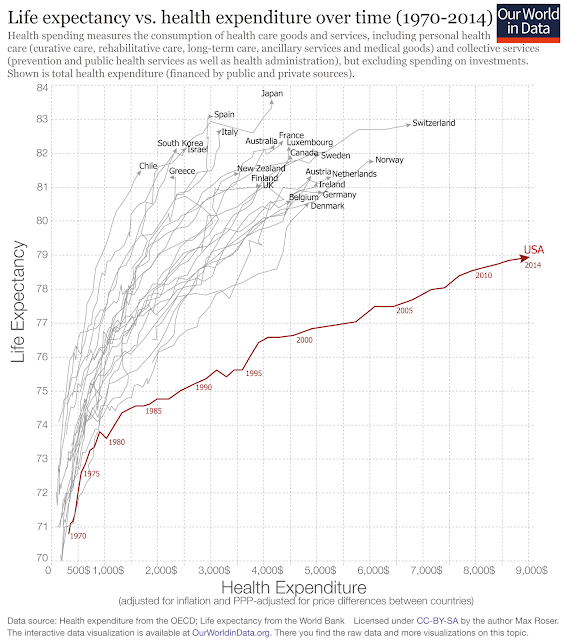 This chart shows US what our corporate warfare state costs in terms of reduced life expectancy. The rude truth is that by 2030 the length of our lives will be on par with the Czech Republic for men and Mexico for women. We have the absurd distinction of being the only country in the OECD (Organization for Economic Co-operation and Development) that does not provide its citizens' universal health care coverage. It also has the highest infant mortality rate of its economic peers, the highest homicide rate, and highest body fat index according to the World Health Organization. A sad, sad state of the nation. But do not worry, John McCain's brain tumor operation will be covered by his Senate health insurance, if not by the Department of Veterans Affairs! DC Appeals Says Trump Circus "Arbitrary"